Here are Sam's two comedy routines he worked up for our church talent shows. One last fall and one this past week. Has there ever been a time when you were so sure you were right? You were positive you were right! No one could convince you otherwise. One time, I had a big disagreement with Aaron. I don’t remember it getting heated but maybe it did. I certainly was right and he was definitely wrong. I knew, I just knew that Weird Al Yankovic was Canadian. I had heard it somewhere I just knew I was right. By the way, have you noticed that this is the 2nd blog post in a row that mentions Weird Al? Well, guess what, Weird Al is not Canadian. I was wrong. And I have been sorely mistaken about much more important things than Weird Al’s country of origin. In the book of Acts, when Stephen’s own people were killing him for his faith in Jesus, they laid their coats at the feet of a young man named Saul. This same Saul started “breathing out threats and murder” against the people of the Way. He got a letter of permission from the high priest to arrest any he found. He travelled to Damascus, 150 miles from home, to find more of them and bring them bound back to Jerusalem. Saul was right. Until he met Jesus on the way. It was a fearful, humiliating, loving encounter that left Saul shaken, blind and weak. He was brought face to face with the one he was persecuting and he knew he was wrong. It seems Jesus takes personally all that we do to one another. Saul is led on to his destination but he doesn’t do what he had come to do. Instead, he stops eating and starts praying. Three days of intense reflection gives him a vision of a man, a friendly man who comes to pray with him. God tells Ananias to go to this murderer who is praying. God tells him that he’s already set the meeting up. Ananias reminds God about who Saul is. God tells Ananias that he knows who Saul is. They’ve met. So Ananias does what he’s been told. He goes to the enemy. And what does he say upon entering the house of Saul’s wrestling? “Brother Saul!” And the blindness fell away and he finally started eating (the part of the story I am so relieved by) and he received strength. 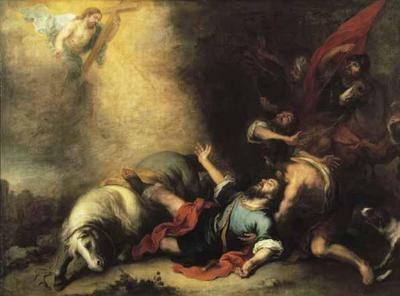 Saul had an encounter with the real Jesus. He saw him personally. But he still needed a friend. We need Jesus. We need each other.